Included in this pack are Middle sound play dough spelling cards and Clip It activity cards. 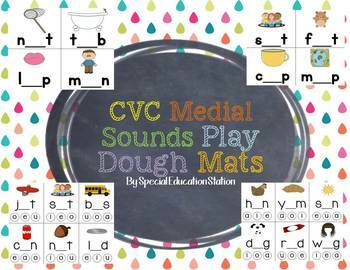 Medial sound play dough cards. The cards feature a common CVC words on it and students have to use play dough to fill in the missing beginning letter to complete the word. 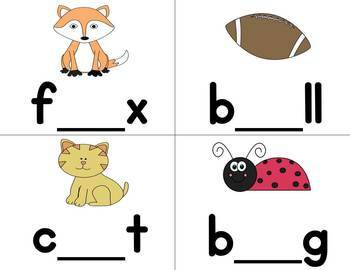 5 sets of 8 cards are included for a total of 40 cards.A recording sheet is included for student to write the completed word out next to the picture it matches. Clip It Middle Sound Cards: Students use a clothespin to clip the circle with correct middle sound in it. 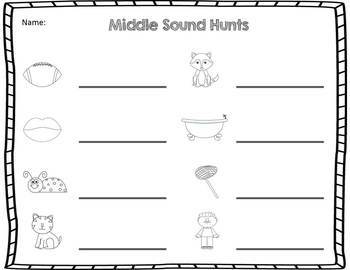 This is a great hands on activity for little learners to use while practicing beginning sounds. The cards can also be used for scavenger hunts: simply paste the cards around the room. Then have students travel around the room looking for the cards. 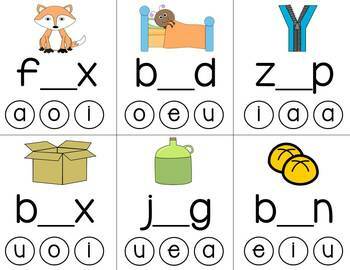 Write the full word, with the missing beginning letter, on the recording sheet next to the number that is one the card. Check out the preview for an idea of what is included.